The Debian package is not only an archive of files intended for installation. It is part of a larger whole, and it describes its relationship with other Debian packages (dependencies, conflicts, suggestions). It also provides scripts that enable the execution of commands at different stages in the package's lifecycle (installation, removal, upgrades). These data are used by the package management tools but are not part of the packaged software; they are, within the package, what is called its “meta-information” (information about other information). RFC is the abbreviation of “Request For Comments”. An RFC is generally a technical document that describes what will become an Internet standard. Before becoming standardized and frozen, these standards are submitted for public review (hence their name). The IETF (Internet Engineering Task Force) decides on the evolution of the status of these documents (proposed standard, draft standard, or standard). RFC 2026 defines the process for standardization of Internet protocols. In a list of conditions to be met, the comma serves as a separator. It must be interpreted as a logical “and”. In conditions, the vertical bar (“|”) expresses a logical “or” (it is an inclusive “or”, not an exclusive “either/or”). Carrying greater priority than “and”, it can be used as many times as necessary. Thus, the dependency “(A or B) and C” is written A | B, C. In contrast, the expression “A or (B and C)” should be written as “(A or B) and (A or C)”, since the Depends field does not tolerate parentheses that change the order of priorities between the logical operators “or” and “and”. It would thus be written A | B, A | C.
The dependencies system is a good mechanism for guaranteeing the operation of a program, but it has another use with “meta-packages”. These are empty packages that only describe dependencies. They facilitate the installation of a consistent group of programs preselected by the meta-package maintainer; as such, apt install meta-package will automatically install all of these programs using the meta-package's dependencies. The gnome, kde-full and linux-image-amd64 packages are examples of meta-packages. “Pre-dependencies”, which are listed in the “Pre-Depends” field in the package headers, complete the normal dependencies; their syntax is identical. A normal dependency indicates that the package in question must be unpacked and configured before configuration of the package declaring the dependency. A pre-dependency stipulates that the package in question must be unpacked and configured before execution of the pre-installation script of the package declaring the pre-dependency, that is before its installation. A pre-dependency is very demanding for apt, because it adds a strict constraint on the ordering of the packages to install. As such, pre-dependencies are discouraged unless absolutely necessary. It is even recommended to consult other developers on debian-devel@lists.debian.org before adding a pre-dependency. It is generally possible to find another solution as a work-around. The Recommends and Suggests fields describe dependencies that are not compulsory. The “recommended” dependencies, the most important, considerably improve the functionality offered by the package but are not indispensable to its operation. The “suggested” dependencies, of secondary importance, indicate that certain packages may complement and increase their respective utility, but it is perfectly reasonable to install one without the others. You should always install the “recommended” packages, unless you know exactly why you do not need them. Conversely, it is not necessary to install “suggested” packages unless you know why you need them. The Enhances field also describes a suggestion, but in a different context. It is indeed located in the suggested package, and not in the package that benefits from the suggestion. Its interest lies in that it is possible to add a suggestion without having to modify the package that is concerned. Thus, all add-ons, plug-ins, and other extensions of a program can then appear in the list of suggestions related to the software. Although it has existed for several years, this last field is still largely ignored by programs such as apt or synaptic. Its purpose is for a suggestion made by the Enhances field to appear to the user in addition to the traditional suggestions — found in the Suggests field. The Conflicts field indicates when a package cannot be installed simultaneously with another. The most common reasons for this are that both packages include a file of the same name, or provide the same service on the same TCP port, or would hinder each other's operation. dpkg will refuse to install a package if it triggers a conflict with an already installed package, except if the new package specifies that it will “replace” the installed package, in which case dpkg will choose to replace the old package with the new one. apt always follows your instructions: if you choose to install a new package, it will automatically offer to uninstall the package that poses a problem. The Breaks field has an effect similar to that of the Conflicts field, but with a special meaning. It signals that the installation of a package will “break” another package (or particular versions of it). In general, this incompatibility between two packages is transitory, and the Breaks relationship specifically refers to the incompatible versions. dpkg will refuse to install a package that breaks an already installed package, and apt will try to resolve the problem by updating the package that would be broken to a newer version (which is assumed to be fixed and, thus, compatible again). This type of situation may occur in the case of updates without backwards compatibility: this is the case if the new version no longer functions with the older version, and causes a malfunction in another program without making special provisions. The Breaks field prevents the user from running into these problems. This field introduces the very interesting concept of a “virtual package”. It has many roles, but two are of particular importance. The first role consists in using a virtual package to associate a generic service with it (the package “provides” the service). The second indicates that a package completely replaces another, and that for this purpose it can also satisfy the dependencies that the other would satisfy. It is thus possible to create a substitution package without having to use the same package name. Virtual packages, however, do not exist physically; they are only a means of identifying real packages based on common, logical criteria (service provided, compatibility with a standard program or a pre-existing package, etc.). Let us discuss the first case in greater detail with an example: all mail servers, such as postfix or sendmail are said to “provide” the mail-transport-agent virtual package. Thus, any package that needs this service to be functional (e.g. a mailing list manager, such as smartlist or sympa) simply states in its dependencies that it requires a mail-transport-agent instead of specifying a large yet incomplete list of possible solutions (e.g. postfix | sendmail | exim4 | …). Furthermore, it is useless to install two mail servers on the same machine, which is why each of these packages declares a conflict with the mail-transport-agent virtual package. A conflict between a package and itself is ignored by the system, but this technique will prohibit the installation of two mail servers side by side. For virtual packages to be useful, everyone must agree on their name. This is why they are standardized in the Debian Policy. The list includes among others mail-transport-agent for mail servers, c-compiler for C programming language compilers, www-browser for web browsers, httpd for web servers, ftp-server for FTP servers, x-terminal-emulator for terminal emulators in graphical mode (xterm), and x-window-manager for window managers. The full list can be found on the Web. The Provides field is also interesting when the content of a package is included in a larger package. For example, the libdigest-md5-perl Perl module was an optional module in Perl 5.6, and has been integrated as standard in Perl 5.8 (and later versions, such as 5.20 present in Jessie). As such, the package perl has since version 5.8 declared Provides: libdigest-md5-perl so that the dependencies on this package are met if the user has Perl 5.8 (or newer). The libdigest-md5-perl package itself has eventually been deleted, since it no longer had any purpose when old Perl versions were removed. This feature is very useful, since it is never possible to anticipate the vagaries of development, and it is necessary to be able to adjust to renaming, and other automatic replacement, of obsolete software. Perl (Practical Extraction and Report Language) is a very popular programming language. It has many ready-to-use modules that cover a vast spectrum of applications, and that are distributed by the CPAN (Comprehensive Perl Archive Network) servers, an exhaustive network of Perl packages. Since it is an interpreted language, a program written in Perl does not require compilation prior to execution. This is why they are called “Perl scripts”. Virtual packages used to suffer from some limitations, the most significant of which was the absence of a version number. To return to the previous example, a dependency such as Depends: libdigest-md5-perl (>= 1.6), despite the presence of Perl 5.10, would never be considered as satisfied by the packaging system — while in fact it most likely is satisfied. Unaware of this, the package system chose the least risky option, assuming that the versions do not match. This limitation has been lifted in dpkg 1.17.11, and is no longer relevant in Jessie. 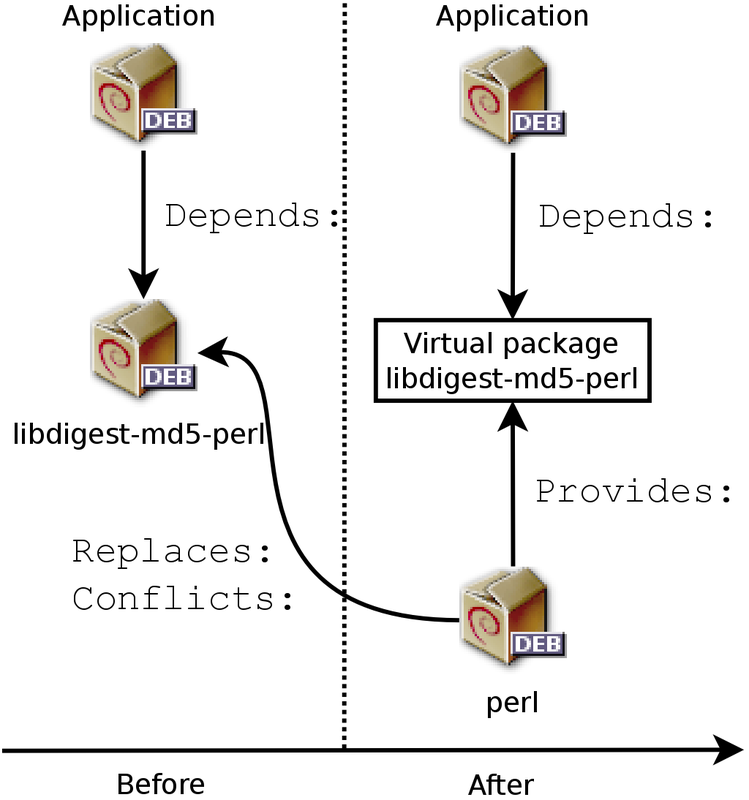 Packages can assign a version to the virtual packages they provide with a dependency such as Provides: libdigest-md5-perl (= 1.8). The Replaces field indicates that the package contains files that are also present in another package, but that the package is legitimately entitled to replace them. Without this specification, dpkg fails, stating that it can not overwrite the files of another package (technically, it is possible to force it to do so with the --force-overwrite option, but that is not considered standard operation). This allows identification of potential problems and requires the maintainer to study the matter prior to choosing whether to add such a field. In addition to the control file, the control.tar.gz archive for each Debian package may contain a number of scripts, called by dpkg at different stages in the processing of a package. The Debian Policy describes the possible cases in detail, specifying the scripts called and the arguments that they receive. These sequences may be complicated, since if one of the scripts fails, dpkg will try to return to a satisfactory state by canceling the installation or removal in progress (insofar as it is possible). All of the configuration scripts for installed packages are stored in the /var/lib/dpkg/info/ directory, in the form of a file prefixed with the package's name. This directory also includes a file with the .list extension for each package, containing the list of files that belong to that package. The /var/lib/dpkg/status file contains a series of data blocks (in the format of the famous mail headers, RFC 2822) describing the status of each package. The information from the control file of the installed packages is also replicated there. In general, the preinst script is executed prior to installation of the package, while the postinst follows it. Likewise, prerm is invoked before removal of a package and postrm afterwards. An update of a package is equivalent to removal of the previous version and installation of the new one. It is not possible to describe in detail all the possible scenarios here, but we will discuss the most common two: an installation/update and a removal. Manoj Srivastava made these diagrams explaining how the configuration scripts are called by dpkg. Similar diagrams have also been developed by the Debian Women project; they are a bit simpler to understand, but less complete. For an update, dpkg calls the old-prerm upgrade new-version. Still for an update, dpkg then executes new-preinst upgrade old-version; for a first installation, it executes new-preinst install. It may add the old version in the last parameter, if the package has already been installed and removed since (but not purged, the configuration files having been retained). The new package files are then unpacked. If a file already exists, it is replaced, but a backup copy is temporarily made. For an update, dpkg executes old-postrm upgrade new-version. dpkg updates all of the internal data (file list, configuration scripts, etc.) and removes the backups of the replaced files. This is the point of no return: dpkg no longer has access to all of the elements necessary to return to the previous state. dpkg will update the configuration files, asking the user to decide if it is unable to automatically manage this task. The details of this procedure are discussed in Section 5.2.3, “Checksums, List of Configuration Files”. Finally, dpkg configures the package by executing new-postinst configure last-version-configured. dpkg removes all of the package's files, with the exception of the configuration files and configuration scripts. dpkg executes postrm remove. All of the configuration scripts, except postrm, are removed. If the user has not used the “purge” option, the process stops here. For a complete purge of the package (command issued with dpkg --purge or dpkg -P), the configuration files are also deleted, as well as a certain number of copies (*.dpkg-tmp, *.dpkg-old, *.dpkg-new) and temporary files; dpkg then executes postrm purge. When a Debian package is removed, the configuration files are retained in order to facilitate possible re-installation. Likewise, the data generated by a daemon (such as the content of an LDAP server directory, or the content of a database for an SQL server) are usually retained. To remove all data associated with a package, it is necessary to “purge” the package with the command, dpkg -P package, apt-get remove --purge package or aptitude purge package. Given the definitive nature of such data removals, a purge should not be taken lightly. The four scripts detailed above are complemented by a config script, provided by packages using debconf to acquire information from the user for configuration. During installation, this script defines in detail the questions asked by debconf. The responses are recorded in the debconf database for future reference. The script is generally executed by apt prior to installing packages one by one in order to group all the questions and ask them all to the user at the beginning of the process. The pre- and post-installation scripts can then use this information to operate according to the user's wishes. debconf was created to resolve a recurring problem in Debian. All Debian packages unable to function without a minimum of configuration used to ask questions with calls to the echo and read commands in postinst shell scripts (and other similar scripts). But this also means that during a large installation or update the user must stay with their computer to respond to various questions that may arise at any time. These manual interactions have now been almost entirely dispensed with, thanks to the debconf tool. debconf has many interesting features: it requires the developer to specify user interaction; it allows localization of all the strings displayed to users (all translations are stored in the templates file describing the interactions); it has different frontends to display the questions to the user (text mode, graphical mode, non-interactive); and it allows creation of a central database of responses to share the same configuration with several computers... but the most important is that it is now possible to present all of the questions in a row to the user, prior to starting a long installation or update process. The user can go about their business while the system handles the installation on its own, without having to stay there staring at the screen waiting for questions. In addition to the maintainer scripts and control data already mentioned in the previous sections, the control.tar.gz archive of a Debian package may contain other interesting files. The first, md5sums, contains the MD5 checksums for all of the package's files. Its main advantage is that it allows dpkg --verify (which we will study in Section 14.3.3.1, “Auditing Packages with dpkg --verify”) to check if these files have been modified since their installation. Note that when this file doesn't exist, dpkg will generate it dynamically at installation time (and store it in the dpkg database just like other control files). In effect, in this situation, dpkg behaves as intelligently as possible: if the standard configuration file has not changed between the two versions, it does nothing. If, however, the file has changed, it will try to update this file. Two cases are possible: either the administrator has not touched this configuration file, in which case dpkg automatically installs the new version; or the file has been modified, in which case dpkg asks the administrator which version they wish to use (the old one with modifications, or the new one provided with the package). To assist in making this decision, dpkg offers to display a “diff” that shows the difference between the two versions. If the user chooses to retain the old version, the new one will be stored in the same location in a file with the .dpkg-dist suffix. If the user chooses the new version, the old one is retained in a file with the .dpkg-old suffix. Another available action consists of momentarily interrupting dpkg to edit the file and attempt to re-instate the relevant modifications (previously identified with diff). dpkg handles configuration file updates, but, while doing so, regularly interrupts its work to ask for input from the administrator. This makes it less than enjoyable for those who wish to run updates in a non-interactive manner. This is why this program offers options that allow the system to respond automatically according to the same logic: --force-confold retains the old version of the file; --force-confnew will use the new version of the file (these choices are respected, even if the file has not been changed by the administrator, which only rarely has the desired effect). Adding the --force-confdef option tells dpkg to decide by itself when possible (in other words, when the original configuration file has not been touched), and only uses --force-confnew or --force-confold for other cases. These options apply to dpkg, but most of the time the administrator will work directly with the aptitude or apt-get programs. It is, thus, necessary to know the syntax used to indicate the options to pass to the dpkg command (their command line interfaces are very similar). The --force-confask option requires dpkg to display the questions about the configuration files, even in cases where they would not normally be necessary. Thus, when reinstalling a package with this option, dpkg will ask the questions again for all of the configuration files modified by the administrator. This is very convenient, especially for reinstalling the original configuration file if it has been deleted and no other copy is available: a normal re-installation won't work, because dpkg considers removal as a form of legitimate modification, and, thus, doesn't install the desired configuration file.